More twisted tales from the darkest place on Earth. It’s hard to believe, but it’s been nearly ten years since the release of the original Sin City movie. I’ve been looking forward to this film for a long time myself but even I was surprised when I heard that the last one came out in 2005. I am an old man though and the years seem to contract the older I get. It didn’t exactly feel like almost a decade had passed since my last sojourn into Frank Miller’s seedy metropolis. Though it’s been a while, it was nice to revisit this world and see some familiar faces… even if some of those faces were different. One thing that people need to keep in mind is when this movie takes place. Some of the main characters which died in the first movie make a return. No, they weren’t resurrected and this isn’t an alternate world. A lot of the events from this film take place well before the original. This is why Marv is still around and why Manute still has both eyes. This movie, just like the comics, is told in a very non-linear fashion and things don’t progress in chronological order. Though the name of the film is “A Dame to Kill For“, and that tale does encompass the majority of the film, it isn’t the only story that we get to see. Interestingly enough, two of the stories in the movie are completely original works written by Frank Miller himself. Yeah, I’ve read the comics before, but it’s been nearly twenty years since I did. If you told me that these two stories were from the comics, I would have believed you. They fit perfectly within the Sin City world and they helped bookend the entire film to some extent. What I liked about the books and the previous movie are the characters and the same applies to this film. Since the characters in the movie are so unlike me or anyone that I know, I find them fascinating. The one who intrigues me the most is Marv. I really have no idea what motivates this guy. It seems like his whole purpose in life is to go around getting into fights and killing people. He seems altruistic with wanting to help his friends but it seems like a thinly veiled excuse to satiate his bloodlust. Though I can’t relate to most of the characters, I can at least somewhat understand their motivation. Marv? I have no clue what drives this man and that’s why I’m drawn to him. On the opposite side of this is the titular dame to kill for herself, Ava. Eva Green does a great job of portraying this vile and evil character. She looks as beautiful as an angel but is anything but. I’m sure that a lot of guys have been with women like Ava (although I’m assuming they were less murder-y) so seeing Dwight and the other men fall into her trap is equally frustrating and relatable. She was as fantastic a villain as you can get. 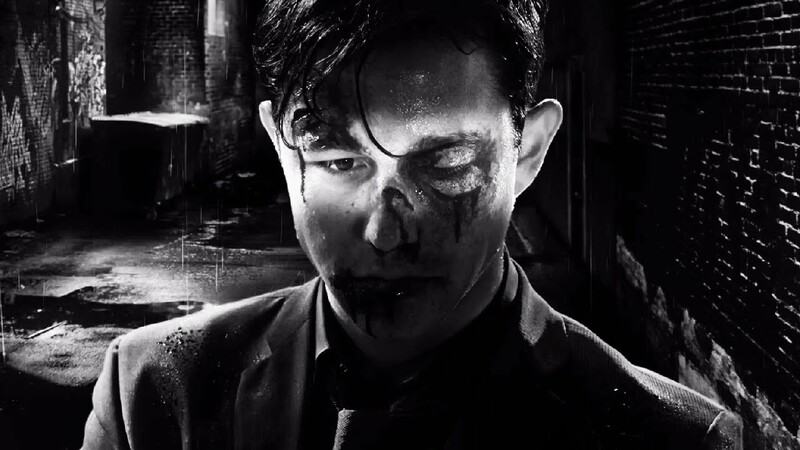 Of course, the main character of the movie is Sin City itself. This is a brutal and harsh place where mercy and compassion have no room to flourish. While there may be small acts of kindness from some, they are vastly outnumbered by all of the terrible and unspeakable things that the denizens do to each other. Even if you’re a person who is as dark and twisted as the city is, that doesn’t guarantee your safety or your happiness. Weak or strong, rich or poor, Sin City will swallow you up eventually. Life is cheap on these streets and you can feel the hatred that the city has for its citizens permeate the entire movie. Helping to give the world its dark ambiance is the visual style of the movie. Like with the previous film, I was completely captivated by the look of the movie. Black and white films have always been appealing to these eyes of mine. I love how they can use shadows and light in a way that color films can’t. Since there aren’t many movies with this look, I was instantly sucked in visually. The movie tries to emulate the pure black and white look of the comics during certain scenes and these were the ones I liked best. I say this because, though technically a black and white movie, it does have many shades of grey. These are three dimensional people after all so creating flat black and white imagery would be difficult to pull off consistently. When the movie does it with a purely white wig, fishnet stocking or glasses which are surrounded by pure blacks, it looks fantastic. Though mostly black, white and grey, the movie does have color in it and this is where things got a bit hit or miss for me. The first film had some color too but you seldom saw it. This movie is a little more liberal about its use of color which kind of makes things or people that have color less special. I loved how color was used on Ava’s green eyes and red lips and for some of the other characters. Things like flashing red lights on cars, yellow and red explosions and red blood being constantly on the screen lessened the effect of seeing color. The biggest complaint I have about the film is the pacing and directing. The movie felt too rushed in some places, particularly in the action scenes which felt like they needed more time to breathe. There was some really awesome and nasty stuff that happened during fights that didn’t have the impact that they should have because things moved too fast. Also, the overall pacing of the movie felt weird. The movie is telling several different stories at once and not all of them take place in the same timeline. However, that isn’t much of an excuse considering how masterfully the original movie handled all of its disparate plot lines. Also, the abrupt way things began and ended left me scratching my head somewhat. One minor thing that threw me off a bit was how some characters were portrayed by different actors. The last movie came out so long ago that some of them simply weren’t available or, in the unfortunate case of Michael Clarke Duncan, passed away. Had this movie come out two years after the first one I’m sure that we would have seen most of the originals return. This isn’t a knock on any of the performances however. Dennis Haysbert does a good job as Manute although he isn’t quite the imposing figure that Clarke was. Josh Brolin, who plays Dwight, looks nothing like Clive Owen but considering that Dwight is always changing his face, I was able to let this one slide. Again, not a major issue, but I won’t deny that I wish that some of the original actors were in this one. I enjoyed the film for what it had to offer but I’ll admit that, in retrospect, it isn’t as strong as the original. Audiences who just know the first movie may be disoriented by seeing characters return with no explanation. The film does nothing to tell audiences when certain events happen with respect to the first movie. Despite some quibbles though, I felt the movie did a good job of presenting Sin City in all of its decadent and destructive glory. The movie may not have the appeal of its predecessor but it is a good adaptation of the comic book world it’s based on and is certainly one of the most visually interesting movies out there. Don’t forget to listen to Richard Bailey, Emilio Lopez and myself talk about Sin City: A Dame to Kill For in the latest episode of Spoiler Alert.